Recently I saw two films, each with a Herzogian story about a person who undertakes an ill-advised journey. Kumiko, the Treasure Hunter directed and co-written by David Zellner, is, I’m told, based on a Japanese urban legend. 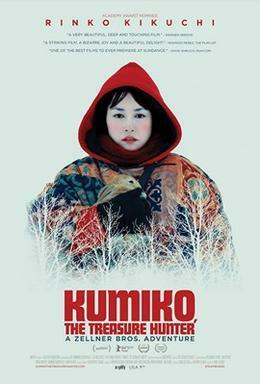 Kumiko (Rinko Kikuchi) has a dreary job as a personal assistant to a Tokyo businessman. Yearning to escape from her humdrum life, she dreams of becoming a treasure hunter. She finds an old VHS tape of the Coen brothers’ Fargo, and she becomes convinced that it tells a true story. She believes that the money buried by one of the characters is lying in a field somewhere in Minnesota. She steals her boss’s credit card and uses it to purchase a plane ticket to Minneapolis. From there, she sets out for Fargo, convinced that she will somehow find the field she saw in the film. Along the way, she meets a number of different people who try to help her. This film’s “happy” ending is not quite ironic and not quite cynical. Zellner is clearly aiming for a fairy tale effect here. He succeeds in this largely because of Kikuchi’s convincing and moving performance. 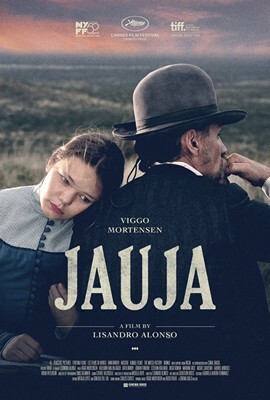 The trailer for Jauja gave me high hopes, but I found the film itself disappointing. The film is set in Argentina in the 19th century. The Argentine government is waging a genocidal war against the indigenous people of Patagonia. Gunnar (Viggo Mortenson) is a Danish doctor who has been hired by the Argentine army. He has brought his daughter, Ingeborg (Viilbjørk Malling Agger), from Denmark with him. When Ingeborg runs off into the desert with a soldier, Gunnar goes in pursuit of them. He finds the soldier murdered. While he is searching the area, an Indian steals his horse, so Gunnar is forced to continue his search on foot. He comes across an old woman who lives by herself in the desert. Jauja‘s early scenes have a stark beauty and simplicity about them that reminds one of Herzog’s films. However, it suddenly turns into a Bergmannesque fantasy about a spooky old woman living in a cave. Like Kumiko, this film aims for a fairy tale effect, but it merely ends up being opaque. I found this disappointing, because I really wanted to see Gunnar’s quest lead to something. Instead, we have what feels like two different films stuck together. In addition, Jauja touches upon the racist attitude of the whites towards the Indians, but it doesn’t really have anything to say about this. It’s just a perplexing and unsatisfying work. This entry was posted on April 24, 2015 at 7:15 am and is filed under Argentina, Cinema, Japan, Werner Herzog. You can follow any responses to this entry through the RSS 2.0 feed. You can leave a response, or trackback from your own site. Kumiko was beautiful – I saw it a few weeks ago. The rabbit did it for me. Look forward to Jauja, even if you give reasons to be sceptical. The rabbit was good. He almost stole the film!